Russell Norman and Richard Beatty, the people behind the successful eateries Polpo, Polpetto, Spuntino and Da Polpo, have produced another offspring with Mishkin’s in Covent Garden. Mishkin’s bears the trademark of the other Norman and Beatty restaurants in the sense that it is cool, hip and happening, but deviates as it steers away from their Italian tapas theme. With Mishkin’s they’ve tapped into the vein of a New York styled Jewish deli, one that also serves cocktails. The restaurant has a grungy Lower East Side vibe to it with its exposed brick work, metallic topped bar and banquette seating. And let’s not forget the cramped space which makes it feel even more like a New York eating hole. Towards the back of the restaurant were some tiny tables, and it was on one of them that were placed. Our particular table was lopsided. It was unclear to me whether this was a deliberate attempt to be avante-garde , but irrespective, it was rather impractical as our matzo ball soup split when it was placed onto the even table. 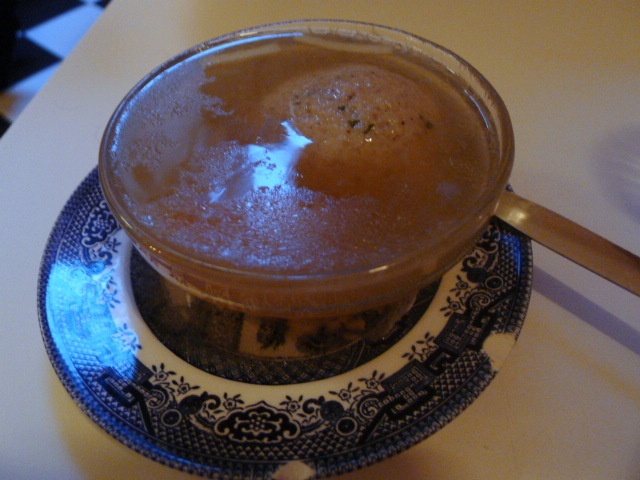 The chicken broth in the soup (£6) had a nice chicken flavour running through it, although it was rather too peppery. The matzo ball itself held together well and had a light and springy texture. 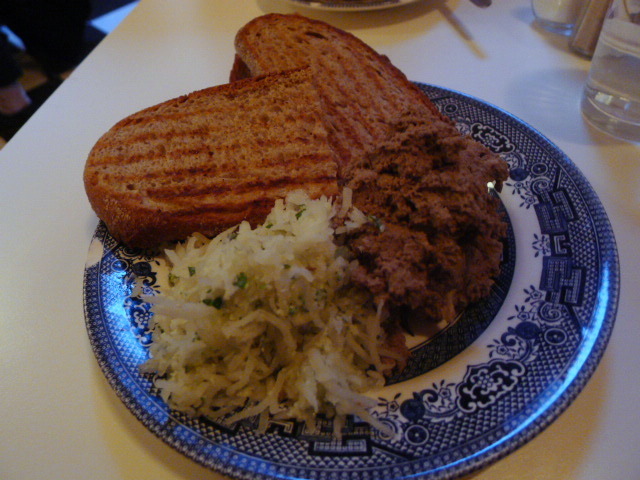 Chopped chicken liver (£7.50) was hearty and produced bags of flavour. Served with toast, it was a touch heavy, and could have done with a little acidity to cut the richness. The accompanying schmaltzed radish was bland as anything and had no flavour. If I ate paper, this is how I imaged that it would taste. To mains, and a meat loaf (£11) encasing a soft boiled egg was disappointing. To be sure, the egg was still runny, so the timing of its cooking had been well judged. However, there wasn’t enough flavour in the meat loaf and it didn’t hold together very well. In fact, it was a little bit soft and crumbled quite easily. Strangely, the side of mashed potatoes had a hint of sourness to it and the cabbage was bland and under seasoned. 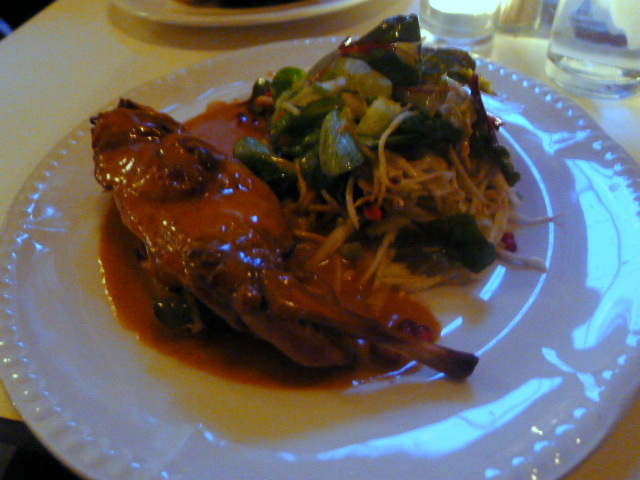 This was not a particularly good dish. The rabbit in a dish of rabbit, paprika and soured cream with celeriac slaw (£13) was a touch dry, but the wonderfully rich and creamy sauce helped to disguise this. I didn’t think much of the slaw however, and once again this was bland. Clearly Mishkin’s do not know how to prepare sides. A rhubarb & apple strudel (£6) was rather lovely. You didn’t quite get the acidity from the rhubarb you might otherwise have expected, and the filling was a little soft, but it wasn’t too sweet and similarly sweet enough to be enjoyable. A little bit more flakiness in the pastry would have also worked better. The malted milkshakes (£4) comes in various flavours and we went for the chocolate one. It was really rich, chocolate-y and very delicious. The food at Mishkin’s was rather underwhelming. There just wasn’t a lot of flavour in some of the things we ate and I found it perplexing how a restaurant can put food on a plate that is so bland and with no taste to speak of. Did the chef not taste, taste, taste his cooking? We didn’t try the sandwiches and perhaps these might have been the saving grace. But I kinda don’t want to go to dinner just to have a sandwich. The service was underwhelming too. Our waiter had little idea of what went into the dishes in the menu. I wasn’t sure that he really cared either. I enjoyed Polpo, the flagship restaurant from the Russell Norman and Richard Beatty fold that scored points for delivering on flavour as well as being en vogue. I also thought Polpetto and Spuntino were good too. But with Mishkin’s, the pair seem to have missed the mark by stretching their tried and tested formula a touch too thin. A fab décor is great, but if you don’t have half decent food, then you really don’t have much to offer. To be sure, Mishkin’s is cheap, and I can see it having a certain appeal to a university crowd, but the latest Norman and Beatty feels like a restaurant that was churned out just so they could make more money. Price range: £19 to £25 for three courses, excluding drinks and service. We had a lunch stop which was great and I enjoyed a fab spiced negroni.